My basic basic model is the SFG, which I have had great success with, has evolved into a very fine instrument. SFG by the way stands for smiley face guitar! I have a strange wife with a wonderful imagination! This new Powell design greatly increases the ‘sweet spot’ giving a full and rich well balanced sound. It is a full sized SFG with the ‘sound’ hole removed from the worst place you could have one on a guitar. The bracing is now a lot lighter allowing the top to vibrate more freely. Available via special order only. 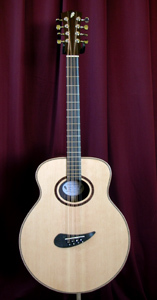 Mid size Guitar, Cittern, and Guitar Shape Bouzouki (Gazouki, special for Julie Matthews). 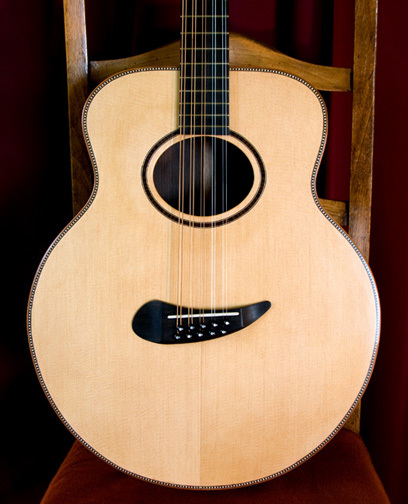 This short scale Bouzouki was commissioned by Julie Matthews and the back and sides are made from beautifully figured English Walnut. I have access to many fine tone woods, should you prefer different woods to the basic model please get in touch to discuss your preferences. 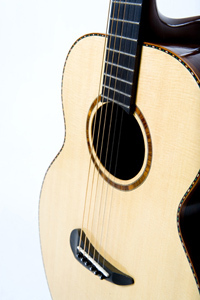 Each material has it’s own characteristics and its input to the finished tone goes hand in hand with playing styles and techniques. 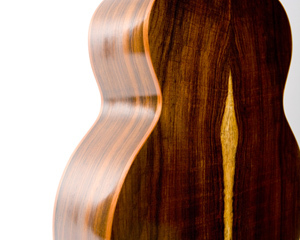 Mahogany for example tends to give softer, warmer tones whereas at the other end Maple can give a more bright, harder tone. For the refined ear, rosewood is in between the two and can give perceived greater projection and depth and is my basic preferred choice for back and sides. 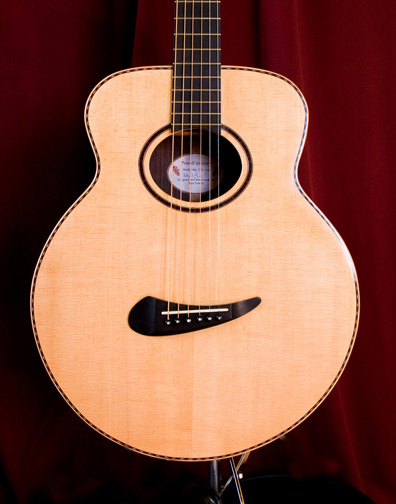 On a recent trip to the Healdsburgh Guitar Festival in Santa Rosa, California I met with Todd Taggart from Allied Lutherie. 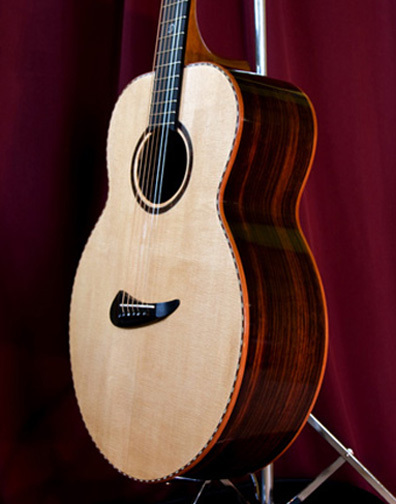 He sometimes stocks Brazilian rosewood stump wood which is fine highly figured sometimes bizarre grain patterned pre CITES Brazilian rosewood stumps left over from the days of heavy logging and ground clearance (photo to follow). 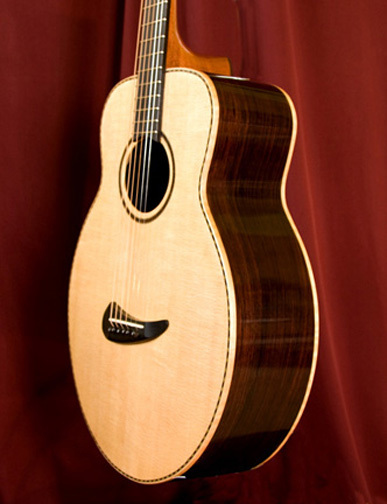 Brazilian Rosewood is an endangered species and thought must be given to using this wood. Some of the larger tone-wood suppliers quite rightly refuse to stock this wood because of its endangered status. 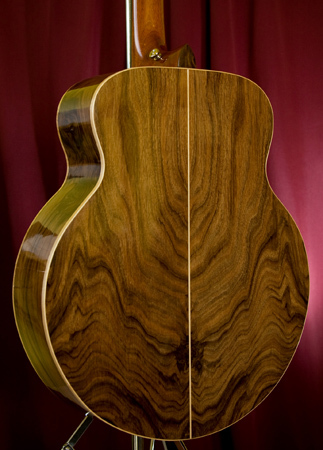 Below is a Brazilian Rosewood back and side set I was very fortunate to find in this country. 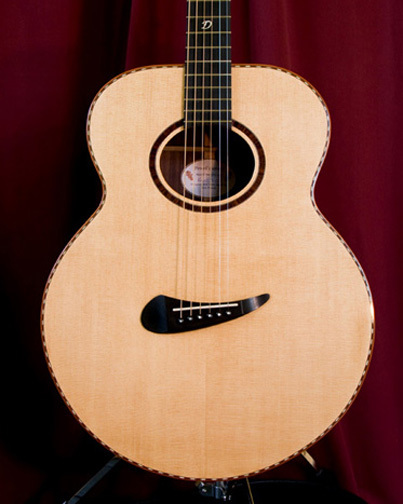 Sitka Spruce is my preferred choice for the steel string top. I have recently found an excellent supplier of great AAA and master grade tops in Alaska, he has always provided me with fantastic wood. My standard is AAA grade and master grade is also available at extra cost. 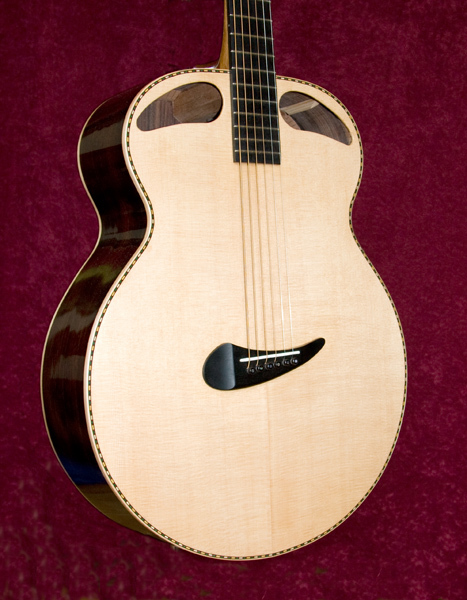 The basic model can be customised with the material or inlay of your choice. My standard logo is an oak leaf. I will be posting a page soon on wood types and perceived tones and properties. Again it all depends on playing styles and abilities. A great sounding guitar just makes you want to play more and more. I read a quote recently “a great instrument makes an average player sound great and a great player sound fantastic” I believe this to be true. I finish my instruments with traditional shellac and use the french polishing technique. The environmental issues associated with the accepted cellulose lacquer spraying is definitely not my approach. When hardened the shellac finish is just as hard, more natural (not like a sheet of plastic) and more important is easy to repair and touch up without having to re varnish the whole instrument.